Laurette Dubé’s career as a nutritionist seems so distant that she calls it “a former life.” Since then she has completed an MBA in Finance, a master’s of professional studies in marketing and a PhD in consumer psychology. She joined the Desautels Faculty of Management as a consumer psychologist in 1995, focusing her research on “non-rational” aspects of decision-making and behavior. In 2000, Dubé found new inspiration in her old career, redirecting her research efforts toward questions of global health. She spearheaded the transdisciplinary Brain-to-Society research program, which initially applied cutting-edge neuroscience and systems science to questions of nutrition and obesity. 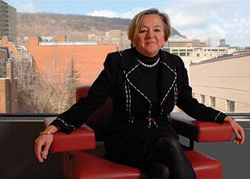 In 2003, she launched the McGill Health Challenge Think Tanks, annual explorations of the intersection of health and economics. After five successful years, which saw luminaries such as economist Paul Krugman and psychologist Daniel Kahneman, both Nobel laureates, join Think Tank discussions, Dubé and her collaborators and partners grew that initiative into the new McGill World Platform for Health and Economic Convergence. Led by the Desautels Faculty of Management and the Faculty of Medicine, the MWP aims to connect the world’s top thinkers and practitioners in science, business, government and health. “Our objective is to put health into economic decisions at all levels,” says Dubé, “and, conversely, to weave economic considerations into health, health care delivery and public health.” She spoke to Headway following the launch of the first annual MWP “Think-and-Do Tank,” held at McGill during November 2009. Because they’re the engine to get this diverse network of experts to develop a system approach to science, policy and action in complex health issues. The Think-and-Do Tanks start the research cycle, and help to drive change on the ground. We’re creating a new transdisciplinary science that feeds, and is fed by, action. The Think-and-Do Tanks bring together a wide array of experts, from geneticists to microeconomists. What is the philosophy behind this seemingly eclectic inclusiveness? When Denis Thérien [McGill Vice-Principal, Research and International Relations] saw the line-up for the first Think Tank, he said, “Laurette, how do all these people fit together?” [laughs] My answer then, and now, is that not all the issues surrounding health are “health issues.” In fact, many of the most intractable health issues facing the world today stem from the collision of historical biological conditioning and everyday contemporary social and economic conditions. That’s why we need to bring together scientists in all domains and decision-makers at all levels and in all sectors. I’m a scientist in consumer psychology and marketing. I need to work with scientists in operation management, finance, political science—and, of course, health and medicine. So many things have to be put together. When we build the list of invitees, we think about what piece of the puzzle is missing, and then figure out who the top person in the world is in that area—and the acceptance rate for people we’ve invited is very high—and then stretch everyone’s thinking and pave the ways to innovation and action. We want, for example, to get the best financial minds to start thinking about how to curb childhood obesity or reduce health inequity. What has the Brain-to-Society research program yielded so far? Our research looks at individual choice in domains like food, where behaviour is driven by the constant interaction between brain and society systems—we’re looking at both as part of the same complex, dynamic and adaptive systems in need of alignment. There are many motives driving human behaviour; knowledge and education aren’t the whole story. So getting people to eat well is much trickier than putting up billboards of carrots. We need to move away from this simplistic idea that if we let people know what to eat, they’ll eat it. It’s much, much more complex. We’re exploring a different approach from the traditional “Count your calories and be good.” It may lead to novel individual interventions. There’s new work being done in our group about the psychological concept of attachment and the relative consumption of fruits and vegetables vis-àvis their more caloric alternative. We’ve done a study on kids between 7 and 12 and their parents, about their consumption and knowledge of fruits and vegetables and fats and sugars. We’re finding that, in both the children and the parents, the more securely attached people were more likely to eat vegetables and less likely to eat fat and sugar. Michael Meaney [Associate Director of the Research Centre at the Douglas Mental Health University Institute and MWP collaborator] has written about biological programming in times of stress, and that’s critical—but the interface of biology and parental nurturing impacts, among other things, how willing you are to explore novel options in your environment. We’re born not liking bitter, but liking sweet. But it might be that the more secure people are more willing to taste flavours they’re not biologically programmed to like. So there are new questions we need to answer about why we, at an aggregate level, don’t eat in a way that our biology can handle. Are marketers exploiting biology, then, because they know we can’t resist their sweet wares? There is clearly some truth in this. What I would like to suggest is that the same knowledge can serve to promote healthy eating as well. Over the past ten years, neuroscience technology like fMRI has shown that learning occurs constantly in the striatal dopamine systems, the brain systems at the core of our biological programming for food. But it doesn’t learn in the same way as the “rational,” but attention-demanding, executive function systems. Much of the recent neuroscience has been to study the reinforcement-based learning processes that are at the roots of conditioned responses to environment cues. My son once explained this part of our Brain-to-Society research program to a friend in this way: Can you condition your brain to get excited about broccoli instead of chocolate? The research program also examines the possibility of identifying individual differences in one’s susceptibility to environment cues. At the level of the dopamine brain system, there are individual differences that cannot only be studied in the scanner, but can also be studied by neurocognitive tests that you can administer to a much larger sample. There are also psychological scales, such as the Behavioral Approach Systems scale that relates to individual differences in dopamine systems’ responsiveness to the environments. So we’re studying an individual’s choice and behaviour as a function of biology, psychology and environment. For example, one research team—Catherine Paquet from the University of South Australia, Baerbel Knauper from McGill, and Mark Daniel, Yan Kestens and Lise Gauvin from Université de Montréal—found that the density of fast food vendors around where one lives is only a significant predictor of fast food consumption for individuals who score in the top thirtile on the BAS scale. I think it’s more complicated to get someone to change their behaviour than it would be to send them to the moon. What is the next step in the MWP’s research agenda? We’re creating the Brain-to-Society Research Centre for Mental and Physical Health and Well Being, which will be the research anchor of the MWP. What we’re seeing is that between the gene and the environment there is life. There are decisions made by individuals, there are choices made by society. Let’s start to use science to model that. It will look at those domains where there is a convergence or divergence between health and economics. Issues involving individual choice, such as addiction, physical activity, sleep, stress, school drop-out rates, aggression. Beyond that, we want to examine issues such as food security and health care access. It’s amazing what happens when you realize how many connections are at play. Four years spent working on obesity and chronic disease led us to start thinking about agricultural production. Last year we hosted a convergence workshop on how to better integrate micro-farmers, who make up 70 per cent of the poor worldwide, with the existing industrial chain—to ensure more sustainability and security. It’s not just about the interface between agriculture and health and nutrition, it’s about the interface between agriculture and the industrial production chain, too. Is the MWP’s end goal to change policy? That’s just part of it. We’re also looking at self-management, at helping individuals. Policy is important, but it will never be enough. 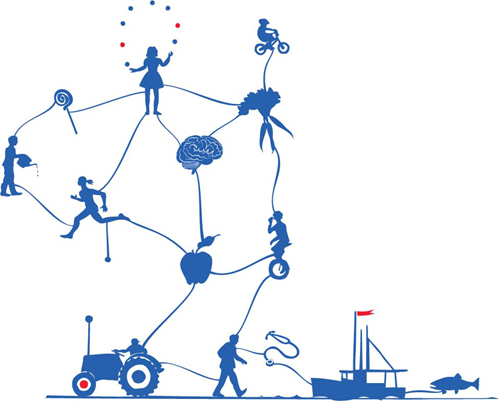 Gaétan Morency, who is one of Cirque du Soleil’s senior vice-presidents and sits on the World Platform’s Strategic Advisory Board, talks about the need to put social health into the DNA of business. Not old-fashioned philanthropy, but things like Bill Gates’s idea of creative capitalism [using market forces to address the needs of the poor], or C.K. Prahalad’s inclusive capitalism [addressing underserved consumers]. That’s exactly what the Platform is about: recognizing that there are major problems tied to the divide between health and economics, and creating more convergence. We want to be known as the place where serious health discussions and serious business discussions co-exist. 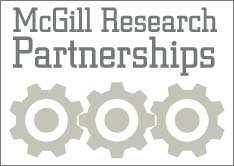 The McGill World Platform for Health and Economic Convergence receives financial support from Health and Social Services Quebec, Health and Social Services Montreal, the Public Health Agency of Canada, the Lucie and André Chagnon Foundation, Développement internationale Desjardins, the Canadian Institute for Health Information and the University of British Columbiaʼs College for Interdisciplinary Studies.